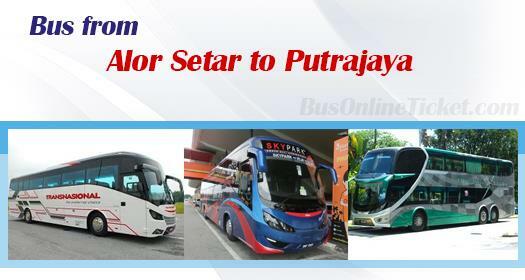 Bus from Alor Setar to Putrajaya is the most convenient transport for residents in Alor Setar to travel to Putrajaya. By taking direct express bus from Alor Setar to Putrajaya, passengers can save their time for transit in Kuala Lumpur to take transfer bus or train to Putrajaya. Transnasional, Plusliner, Sri Maju Express and Trans MVS Express are few bus operators offering bus services from Alor Setar to Putrajaya. Bus service from Alor Setar to Putrajaya is frequent. Their combined trips have total up to 10 daily departures. Buses deployed by these bus operators are spacious and secured to ensure passengers having comfortable journey. The first bus service starts as early as morning 10:00am. The last bus leaves the terminal at 11:59pm. The duration for bus from Alor Setar to Putrajaya is about 6.5 to 7 hours, depending on the traffic and weather condition. All the buses in Malaysia do not install toilet facility, therefore at least one washroom break will be given during the journey. Additional break will be given upon request to the driver. The ticket price for bus from Alor Setar to Putrajaya is charged in a range of RM 47.50 - RM 50.00, depending on your selection of bus operator. For passengers travelling with child, they can book the ticket with Transnasional whom offers child fare at RM 37.50. The boarding point for bus from Alor Setar to Putrajaya is at Alor Setar Bus Terminal and the arrival point in Putrajaya is at Putrajaya Sentral. Even there are many departure schedules from Alor Setar to Putrajaya, passengers are advised to purchase bus ticket online with BusOnlineTicket.com to avoid disappointment. BusOnlineTicket.com is the reliable and user-friendly online booking portal. BusOnlineTicket.com allows you to purchase bus ticket online in anytime, anywhere and anyplace.